Blue Marble Space Institute of Science Young Scientist Participants at NASA Ames, Genesis Berlanga and Stephanie Meursing, conducted an outreach workshop with four and five-year-old students at Stanford Madera Grove Childcare Center which was facilitated by their instructor, Vanya Chandra. We spoke about planetary science, geology, our X-ray diffraction work, and spectroscopy work at NASA, in support of the Mars Science Laboratory Curiosity rover and the CheMin instrument. The activity included talking about rocks, rover instruments, and passing around various quartz and calcite minerals and sandstone rocks similar to those that have been imaged or analyzed on Gale Crater, Mars. The kids were highly motivated and excited to hear about space rocks, X-rays, and lasers! The children were very inquisitive and had many interesting questions ready for us. 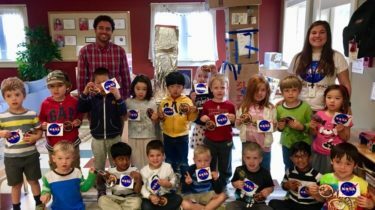 They related this outreach activity and our presentation to their own real-life experiences such as finding rocks and minerals with parents, visiting NASA centers, and the science knowledge they had learned beforehand in their daycare class. Science outreach activities are always inspiring for both the younger and older generations. The students gained knowledge about Mars and Earth geology as well as Mars rovers and instruments, engaged in an immersive hands-on experience handling the rocks and minerals, and sustained a dialogue about all things space, planets, and rocks. We tapped into the students’ curiosity and intrigue for space and showed them a window into potential future career paths with NASA. As presenters we were reminded just how exciting working at NASA is and how we have the influence and responsibility to engage with the general public in science outreach activities. It was a stimulating experience for all involved!